Loaded with tons of vegetables and whole wheat spaghetti, this recipe makes a lighter version of a classic takeout favorite! Cremini mushrooms, red bell peppers, carrot, snow peas, and spinach are stir-fried with soy sauce, ginger, honey, sesame oil, sriracha, canola oil, and garlic. This is tossed with cooked whole wheat pasta and topped with sesame seeds for a beautiful and flavorful garnish. Best part is, the meal is ready to go in 30 minutes! When you choose 100% whole-grain pasta, every serving will contain more natural fiber and micronutrients than traditional white, refined pasta. Per Serving: 270 calories; 11g fat; 36.9g carbohydrates; 13g protein; 0mg cholesterol; 683mg sodium. 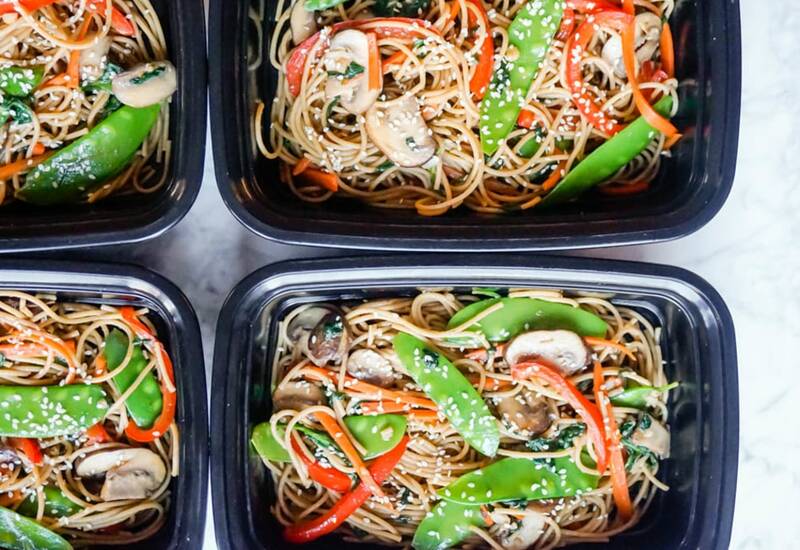 I've tried this veggie lo mien meal prep and it was so good! I was apprehensive about the whole wheat spaghetti noodles, but it was the perfect choice for this dish! The mushrooms and peppers were so flavorful and aromatic. I also really loved the sauce it was cooked in. Next time I will probably mix in lean chicken or shrimp. I swapped out the spaghetti pasta for rice noodles to make this dish. It 's a quick and easy meal that works great for lunch meal prep. I add extra sriracha to make it spicier. Delicious. I made this recipe with all the frozen veggies in my fridge. Rather than the wheat noodles, I subbed in fried rice and that was really good for lunches all week! Loved this vegetarian lo mien! I used actual lo mien noodles and loaded it with a bunch of vegetables. Super light and easy! Wow! This is really good and easy to make! I didn’t have cremini mushrooms, I only had portabellos and it is so delicious. I will definitely be using this recipe again. Next time I will use cremini’s to see if I notice a change in the taste. Thanks for such a great lunch prep meal. So good! I added baked tofu to it and my husband loved it!